Mountshannon Eagles was founded in the Autumn of 2012 after an intense and wonderful Spring and Summer of eagle watching. 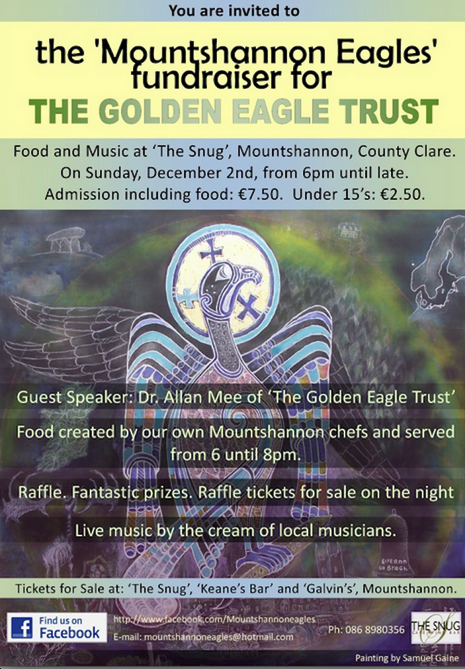 A group was initially set up to organise a fundraiser for the Golden Eagle Trust to say “Thank you!” to them for all their hard work and the enthusiasm they showed the community here in Mountshannon and to support their extraordinary work with the re-introduction program which brought the White-tailed Sea Eagles back to Ireland. The group raised over 1,ooo. euros on behalf of the Golden Eagle Trust. In2012, Dr. Allan Mee and his dedicated team set up at the Harbour with their telescopes and rain gear, to monitor the first eagle nest. They tirelessly educated and informed anyone and everyone who came to the Harbour about these exquisite birds of prey. 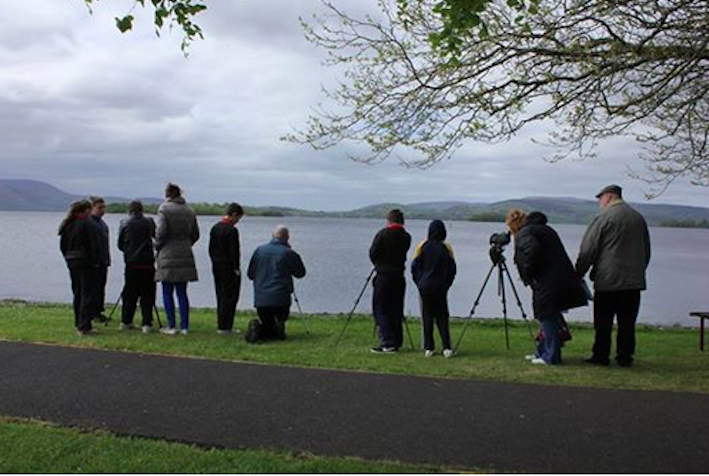 Volunteers from Mountshannon and Whitegate came fully on board to assist with the eagle monitoring and to advise the public about the eagles. 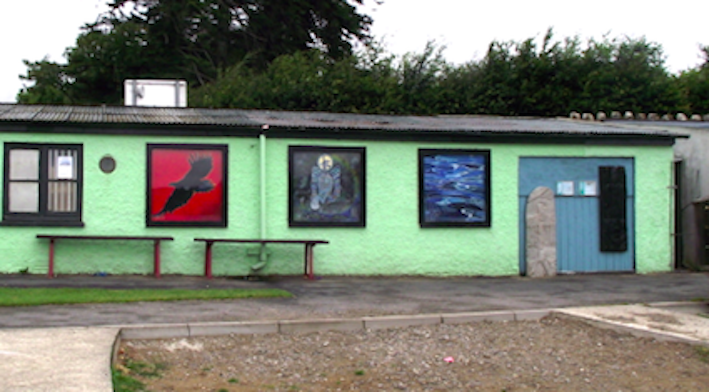 Mary Muggivan very generously gave the use of her building to the Golden Eagle Trust as a centre and viewing place over those two summers. The local Fas CES Scheme renovated the building. And four local artists were commissioned to create art work to hang permently outside the building. (see “eagle stories” for more details). In 2013, from this group of enthusiasts the official group Mountshannon Eagles was formed. Mary Muggivans eagle information building 2012/13.With original eagle art work by local artists. The Mountshannon Eagles group are committed to the conservation and protection of the eagles and their habitat. To creating a venue and website that is informative , educational and interesting. Mountshannon is in an unique position. The eagles have chosen to nest on Lough Derg. We have been given a wonderful opportunity to observe, learn and experience these magnificent birds of prey in their natural wild environment. 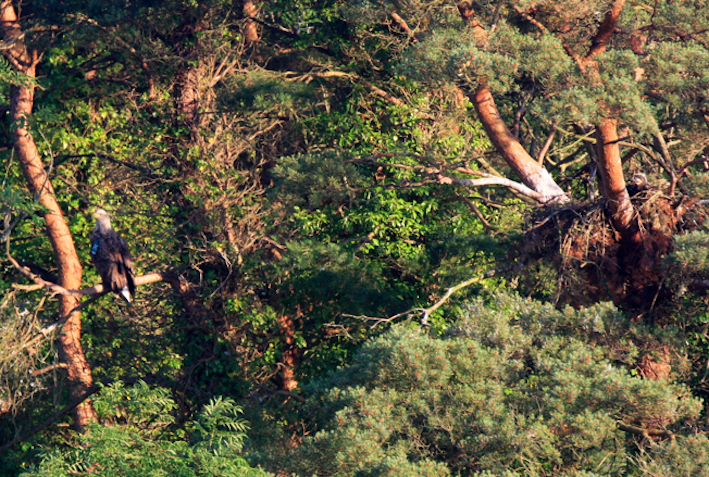 White-tailed Sea eagles have are known to continue nesting in the same area for many years, and it is all our hope that Lough Derg will become home for these eagles and other eagles for many years to come. Bushy Island. Mountshannon Bay. Painting by Sam Gaine. We acknowledge the monumental work that the Golden Eagle Trust has done over the past years and look forward to continuing to work with them to help them their work. Mountshannon eagles are a voluntary, non-profit association. We rely on the generosity and goodwill of individuals and organisations in providing up-to-date information. We would like to make this web-site as relevant, interesting and informative to the public as possible. If you have any photographs, information, local eagle news and stories of interest that you feel would further enhance any of the following pages, please do not hesitate to get in touch. Unfortunately, we cannot pay for your assistance, but can guarantee that you will be afforded suitable accreditation. If you would like to volunteer to help monitor the eagles or assist in any way with the group please contact us. Any help is very much appreciated. 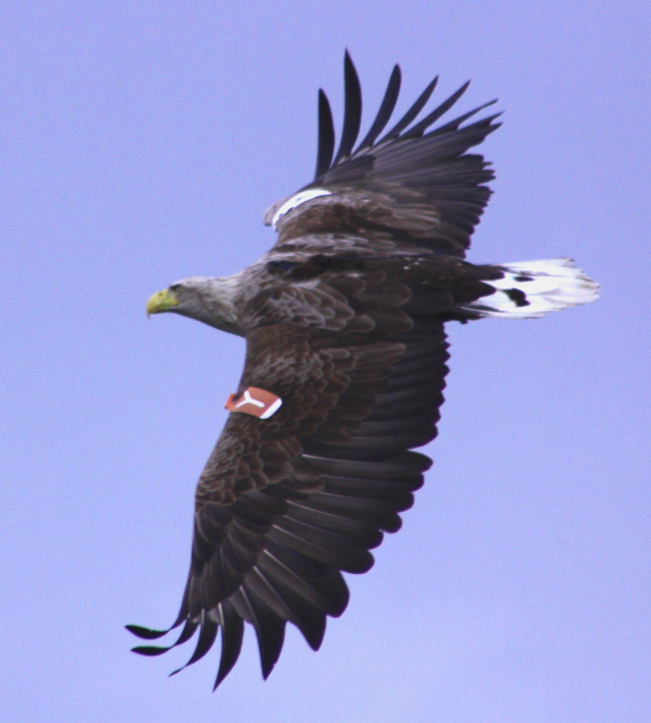 The White-tailed Sea Eagle Reintroduction Programme is managed by the Golden Eagle Trust in partnership with the National Parks and Wildlife Service of the Dept. of Environment, Heritage and Local Government in Ireland and in collaboration with Prosjekt Havørn, the Norwegian Institute for Nature Research and the Directorate for Nature Management in Norway.